Observing the vaping industry, I’ve come to the conclusion that the hardware landscape has become increasingly polarized. On one end, you have devices such as squonk mods. They’re optimized to produce clouds for days, but you’re not going to get your perfect vaping experience out of devices like those without a fair bit of tinkering. On the other end of the spectrum are pod vaping devices that deliver small clouds with big nicotine hits. Those two types of devices are pretty far apart in terms of their complexity and the vaping experiences that they offer. If you find that that neither of those device categories quite fits your vaping profile, all-in-one vaping devices represent a happy medium that might suit you perfectly. 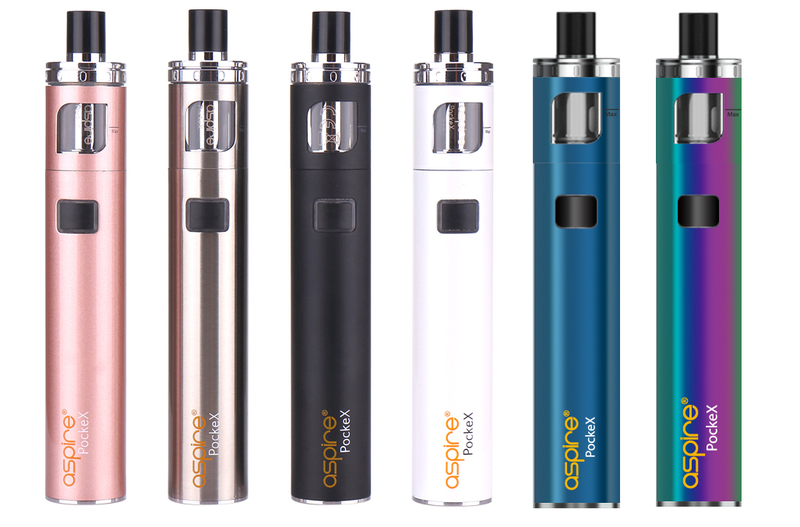 The defining characteristic of an all-in-one vaping device such as the Aspire PockeX is that it has a permanently attached tank. Find a good review of the Aspire PockeX over at Vapester. While most vaping devices have threading that allows you to attach the tank or atomizer of your choice, an all-in-one device only works with one tank. An all-in-one device may work with a few types of atomizer coils, or it may have just one coil available. All-in-one devices are usually vape pens, although a few all-in-one box mods also exist. The benefit of using an all-in-one box mod is that many AIO box mods include adapters that allow you to use any tank you like. Using the adapter, though, does mean that you lose the benefits of owning an all-in-one device. At this point, you might be asking yourself why anyone would want to buy a vaping device that only works with one tank. Such a design might run contrary to the increasingly open and flexible nature of advanced vaping mods, but it also takes a lot of the guesswork out of vaping. If your device only works with one tank, there’s no need to shop around for tanks and worry about whether your device supports a given coil resistance or can deliver its required wattage. Also, if the tank that you have already provides your ideal vaping experience, you don’t need to experiment with other tanks. With an all-in-one device, you’ll fill the tank by pouring e-liquid directly into the body of the device. You’ll then close the device by screwing in an assembly that combines the coil, the chimney and the mouthpiece into a single unit. While most vaping tanks draw air in from the bottom, the air intake vents for an all-in-one device are at the top of the tank. In short, an AIO vaping device has less holes than a traditional vaping tank — and that means your e-liquid is much less likely to leak out. All-in-one devices also tend to be very quiet during use. All-in-one vaping devices are very easy to use. Most operate with a single button. Since an AIO device only works with one coil — or a few coils at most — there’s no need for wattage or temperature adjustments because the device already operates at the ideal wattage for the coil you’re using. AIO devices are also some of the easiest vaping devices to fill. Just twist off the top hardware to expose the e-liquid reservoir. There’s no need to use a narrow-tip bottle to get your e-liquid into a tiny filling hole; just pour it right in. The final major benefit of all-in-one vaping devices is that they don’t force a compromise on performance. If you’ve already switched from smoking to vaping, you don’t want to use a device like the JUUL that forces you to increase your e-liquid nicotine strength to 50 mg. Even some smokers don’t want to consume that much nicotine. All-in-one devices are just a bit larger than small pod vaping devices like the JUUL, but they produce substantially more vapor. With an AIO device, you can choose a reasonable nicotine strength and be fully satisfied. Although I alluded to this above, it bears repeating that you’ll only ever really have one vaping experience with an all-in-one device. Some devices have more than one coil resistance available. If you install a higher-resistance coil and close the airflow vents slightly, you can have a great mouth-to-lung vaping experience. If you install a lower-resistance coil and open the airflow vents, you’ll have a direct-to-lung experience. You’ll never get more vapor out of your device than you will with the lowest-resistance coil available, though, and you’ll never be able to give yourself a substantially different flavor experience by installing a different tank. All-in-one vaping devices have been around for a few years now, and they’ve largely got their technical kinks worked out. One thing that you should look out for, though, is a device with a very long chimney. If the coil is at the bottom of a very deep tank, it might have airflow issues. That problem plagued the VaporFi VAIO, a device that I reviewed a a few years back. The poor airflow caused that device to spit and burn my tongue. In an all-in-one device, the tank is permanently connected. The atomizer coil is the part you’ll replace when the flavor quality starts to decline. In a pod vaping system, the pod is your tank. You’ll replace the entire pod when the flavor quality starts to decline. An AIO vaping device usually works well with virtually every e-liquid on the market. If you use a high-VG e-liquid, for example, there’s usually no need to worry about whether the e-liquid will be too thick to flow through the atomizer coil’s wick holes if you use an all-in-one device. Many pod vaping devices, on the other hand, are set up to work with thinner nicotine salt e-liquids. If you use thicker e-liquids with some pod systems, you’ll get dry hits. Although there are more nicotine salt e-liquids available today than ever before, you’ll have many more choices available if you use a vaping device that doesn’t require thin e-liquids. Since all-in-one devices have glass enclosures — and pod systems have plastic enclosures — you may prefer the flavor of an all-in-one device. With most pod vaping systems, you need to replace the entire pod when the quality of the vaping experience decreases. A pod is a fairly complex piece of vaping hardware that includes an atomizer coil, a clear plastic enclosure and a mouthpiece. When you use an all-in-one device, on the other hand, the enclosure and mouthpiece are permanent parts of the device. The only component that you need to replace periodically is the atomizer coil. Since atomizer coils generally cost less than new pods, you may find that an all-in-one device is cheaper to own over the long term.